Florena "Rena" Thomas, [granddaughter of Mary "Polly" Campbell & Marchant Thomas (s/o Isaac, s/o Old Marchant) and her husband,] Hugh Matlock, with their seven children, Ernest, Earl, Opal, Watie, Raymond, Nadine, and Agnes, left Hanson, Oklahoma for California during a late snowstorm in March of 1924. They traveled in a three-car caravan consisting of three brand new model T Fords. The group consisted of the Matlock family, "Ab" (Albert H.) and Minnie King, who were newlyweds, and Rena's sister and brother-in-law, May and John Maulden with their three children, Emma, J.C., and Dorotha. The oldest Matlock children, Ernest and Earl, rode with the Kings. The group anticipated that the trip would be a hard one. The model T's, known as touring cars, had no windows, heaters, or air conditioners. There was no glass in the car except for the windshield. There were canvas side curtains for use in winter and the passengers used quilts or blankets to cover their laps and feet and in summer the passengers were cooled by the wind blowing through the car as they traveled. There were no hardtop or gravel roads at that time and traveling was slow due to the deep mud holes and slick roads caused by the ice and snow. Most of the day was often spent helping each other get out of mud holes and ditches and on one day the group was only able to travel seventeen miles. It took the caravan a week just to get out of Oklahoma. In those days there were no motels, restaurants, or service stations along the way so the group had to make sure that they carried adequate supplies. They spent their nights in tents that they carried for that purpose and cooked their meals over a campfire. On occasion they were able to pitch their tents in a farmer's barn or livery stable and the weather did turn warmer once they exited Oklahoma. Having never been West, one memory that stood out in the minds of the travelers was the mountain of "snow" that could be seen for two or three days while traversing the state of New Mexico and their shock, when they reached it, to find that it was actually the white sands of New Mexico. As the group crossed Arizona, they had to weave around evergreen trees, sagebrush, and mesquite, following the deep ruts left in the sand by vehicles that had preceded them. The dry creeks, known as washes, had no bridges and had to be crossed carefully so as to avoid becoming stuck in the sand. The rivers had to be crossed by ferries, usually after a long wait. A ferry generally carried four cars and often landed a quarter of a mile or so down the river, which added to the anxiety of the occupants. Reaching the orange growing area around San Bernardino, where fruit stands along the road sold eight pound buckets of oranges for thirty-five cents, was a real delight and crossing the Sierra Nevada mountains, where roads were so narrow that only two cars could meet at the same time, was thrilling. The group finally made it up the San Joaquin Valley to their destination, Chowchilla, by the end of March 1924. They settled in the Central Colony Community and the children started school at Central, where they were the only students at the time from Oklahoma. Their teacher was Miss DeSara. The Matlock's stay in California only lasted four months however, as they all became homesick for Oklahoma. They returned to Oklahoma for about one year and then returned the Central Colony Community, this time with their new baby, Geneva. At the time of their return, Hoof and Mouth Disease was breaking out in the dairy cattle in the area and the children in school were required to march through trays covered with burlap soaked in sheep dip*. 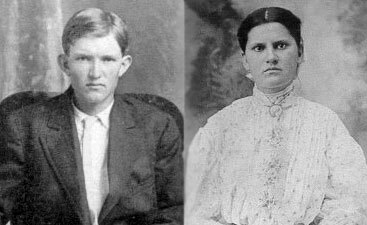 Hugh and Rena eventually became satisfied with the Chowchilla area and permanently relocated to 1013 Riverside Drive in Chowchilla and two of their children, Dorotha and Bernice, were born in California. * Sheep dip is a water-based	pesticide solution that was commonly used in the thirties to help prevent spread of the disease.